Jeg fant en ny låt, den andre, fra svenskenes kommende skive. 19. august er bandet ute med nytt album, det opplyser Nuclear Blast. 'The Last Stand' er nok en gang et samarbeid mellom bandet og produsenten Peter Tägtgren, i Abyss Studio, dette var også malen for 'Carolus Rex' og 'Heroes'. Om coveret sier bassist Pär: "We had the idea to make an image reflecting soldiers of different times representing the different historical battles we sing about on the new album. This only reveals a small part of the album topics though." Vokalist Joakim fortsetter: "The concept of a last stand has always fascinated me, and both me and Pär were all in excited about the subject so it was an easy choice to make." "We have always several ideas for albums to work with. Since there are countless different views and angles of war, we will unfortunately never run out of ideas. 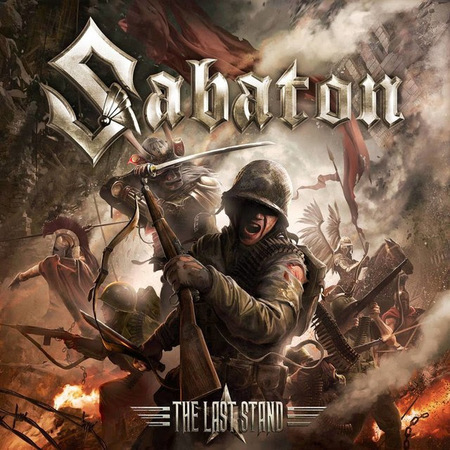 We kinda felt that the last stand was something perfect for Sabaton. Something we really wanted to do. Heroes was a perfect theme and The Last Stand is right down our alley too. It was exciting to do the research" legger bassisten til. Paroxsizhem "Abyss Of Excru... » Blogg « Brainstorm "Scary Creatures"